Dr. Larry Curtis grew up in Pocatello, Idaho. He attended Idaho State University until Viet Nam called and subsequently joined the United States Navy. He was trained in electronics, nuclear reactor operations, satellite communications, antisubmarine warfare and participated in jungle survival training with the Marines. The military sent him to Purdue University where he met his wife. He subsequently earned a Bachelor’s degree from Idaho State University and Doctor of Medicine degree from the University of Washington. He completed a Family Practice postgraduate residency in Evansville, Indiana. Dr. Curtis enjoyed his medical practice in Teton Valley Idaho for 22 years before joining the Rigby Community Care in spring 2008. He has thoroughly enjoyed his Rigby practice, partners, new patients and wonderful former patients that make the long drive from Teton Valley in order to still see him. He was the recipient of the Prestigious Star Garnet award from the Idaho Hospital Association in 2000 and the Medical Group Management Associations Outstanding Leadership Award recipient in 2008. He is a former Speaker of the House of the Idaho Medical Association and is currently the Medical Director of the Jefferson County EMS. He loves the joys of the Family Medicine and his patients are his friends. He and his wife Deborah have six children and 17 grandchildren. He loves all aspects of being a physician, grandpa, father, and husband. Camping and scuba diving are special off time joys… Along with teasing his wife. 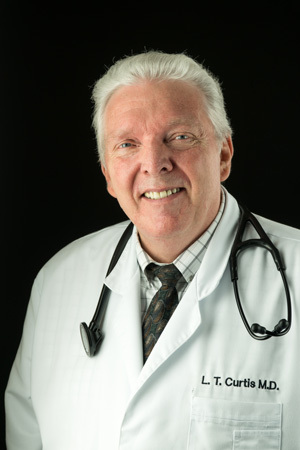 Dr. Larry Curtis is located in our Rigby location.